A thirty foot mural by Gabrielle Fiorentino, with orchids lit by projection lights, accentuate the color, when lights dim. 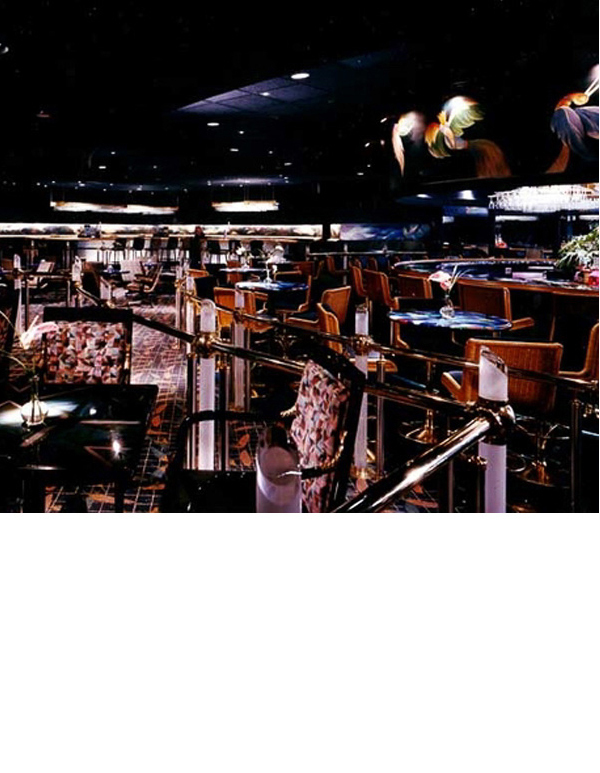 A revolving bar was built on the platform initially constructed for a bucking bronco in a previous club. Birds were painted on soffit over the bar by Carlos Alfonzo. Aurora lights and acylic glass racks were used above the seven bars so that a visual transparency did not interrupt a view of the dance floor. Acylic-post railings were sandblasted on the interior and lit from the base. Alcoves at the end of the room contained steel tubes with lit colored acrylic. Crystal balls lit from inside table bases illuminate gold leaf work on 'universe' lacquered tabletops. Click on cover to see article. Banana Max, a club built in the mid eighties as a local fun spot for dancing, was originally a western club. The bar area had been a revolving floor where patrons could watch a rocking bull. We decided to keep the plate that revolved and build the bar on top so the bar clientele could have a slowly moving scene of the entire space as well as the outside garden while sitting at the bar. 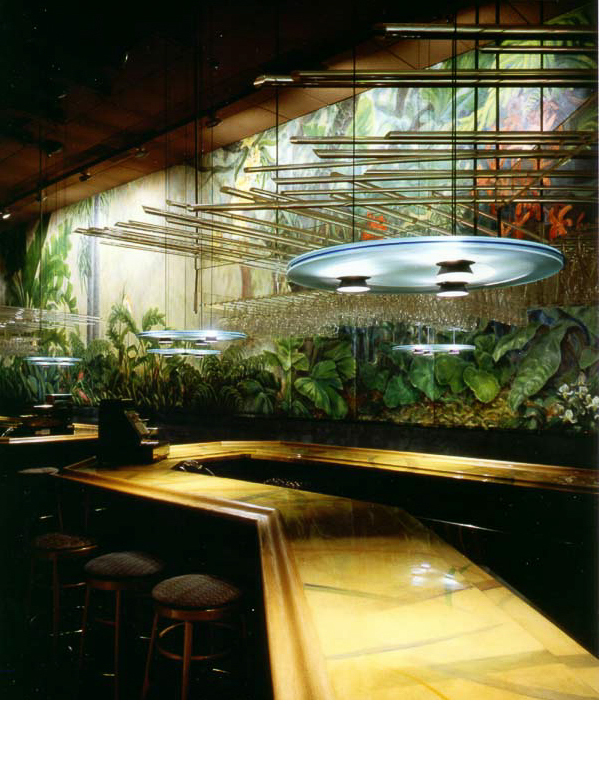 The motif of a wild bird's life begins in the bar with painted birds over the bar by Carlos Alfonzo, a well known artist from Cuba and follows into the darker room with feathers floating on the recessed back wall behind another bar. Finally the bird is in flight in a large dance room surrounded by five large bars where you, the dancer become the bird. Projector lights accent the orchids on the thirty foot mural by Gabrielle Fiorentino of a Florida jungle. The crystal balls in the middle room glow from the base lighting in the tables and light up the night sky painted on the tabletops. Aurora light fixtures used on top of all of the bars allowed for better visibility throughout the main room. As you scroll through the pictures notice temperature difference in coloring, designed into each room, allowing for different experiences depending on where you were as a patron in the club. The club, located on the inner coastal waterway in Jupiter, Florida, was a block from the Burt Reynolds Theater and became the popular area for social gathering, from miles around.